For anyone that loves bingo! 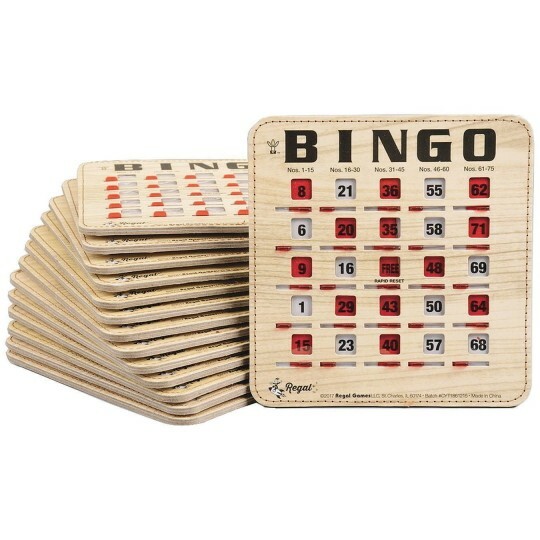 Regal Games stitched extra thick woodgrain rapid reset shutter bingo cards are big tab fingertip shutter bingo cards with heavy paper and stitched construction for great long-term use. Play faster with Regal’s Quick Clear “Rapid Reset” feature, so you can get more games in. Perfect for parties, fundraisers, seniors, or anyone that loves bingo. These cards are 6-1/4” wide x 6-1/2” long and the numbers on the card are 1/4” high. Pack of 25 cards.